Resources - Awareness Technologies, Inc. 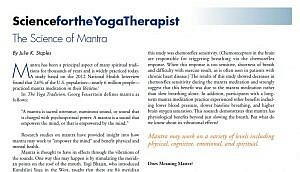 Originally published in Yoga Therapy Today, a publication of the International Association of Yoga Therapists (www.iayt.org). Reprinted with permission. Spring 2018 issue. 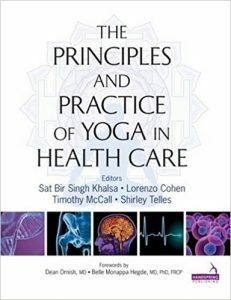 The Principles and Practice of Yoga in Health Care is a professional-level textbook with contributions by multiple expert researchers and therapists in the field. It brings together the science and the practice of yoga therapy and supports the emergence of yoga therapy as a credible profession. Comprehensively summarizes research findings and their practical implications for professionals who use yoga or refer patients for yoga practice. Reviews the scientific evidence base for yoga for a wide variety of medical conditions. The editors include three eminent yoga therapy researchers and one renowned practitioner in the field. They have brought together an experienced team of researchers and yoga therapist contributors. This book will prove essential to yoga therapists, physical therapists, medical doctors, psychologists and other health professionals interested in yoga as a therapeutic intervention.